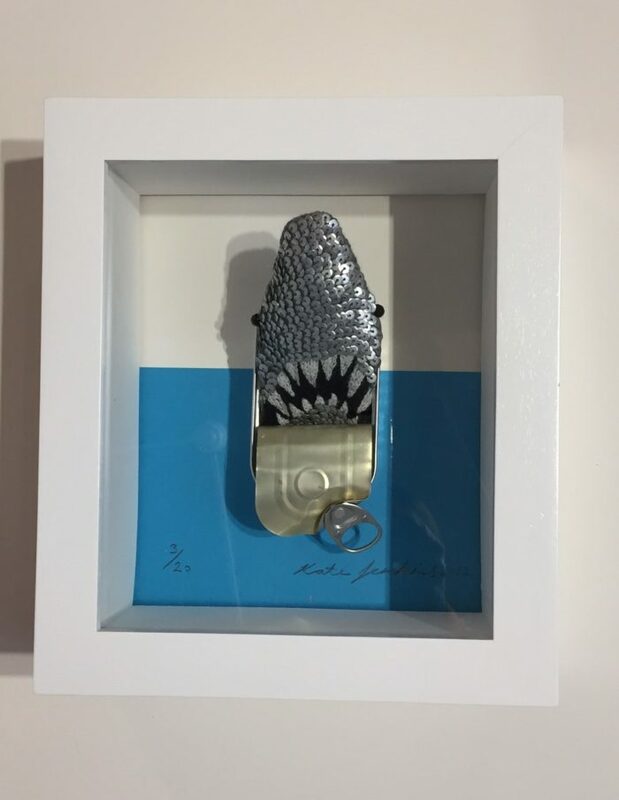 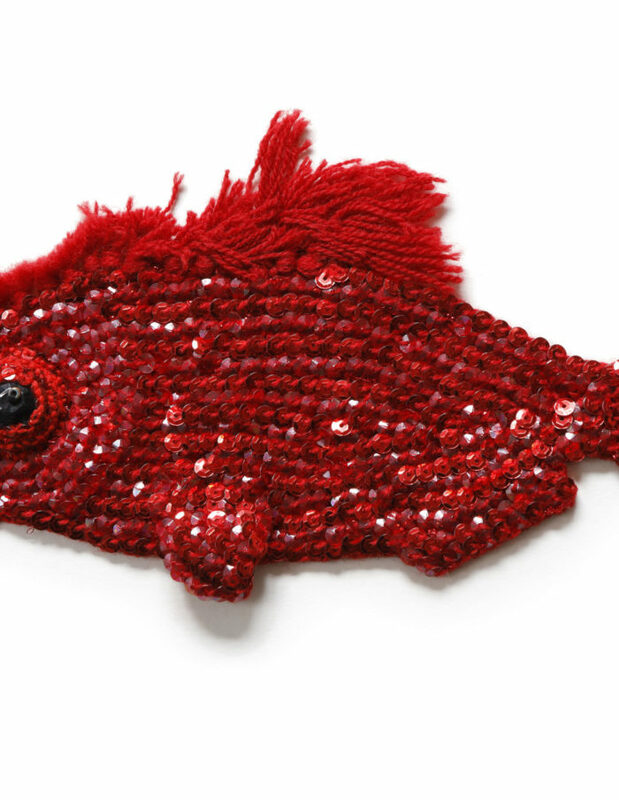 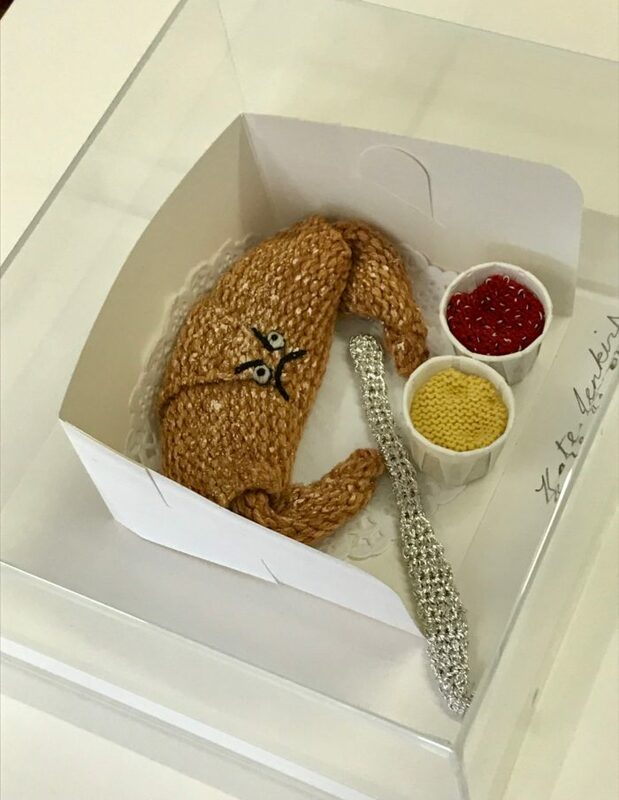 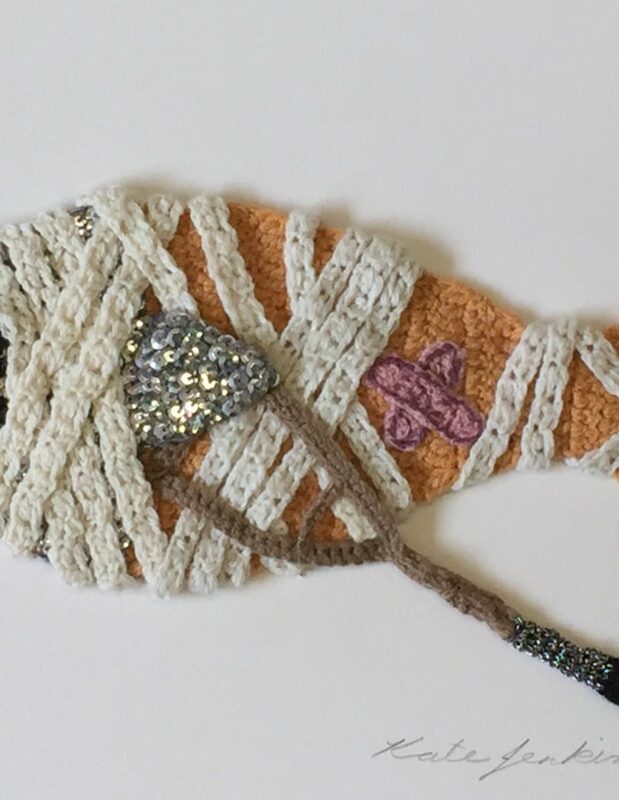 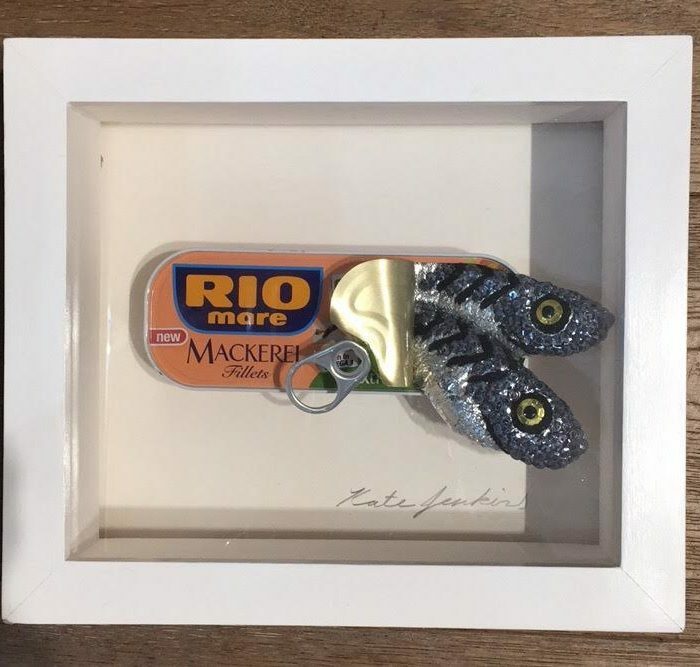 2 Knitted, hand sequined mackerel encased in a recycled tin and presented in a white bespoke wooden box frame measuring 25cm wide x 21.5cm height. 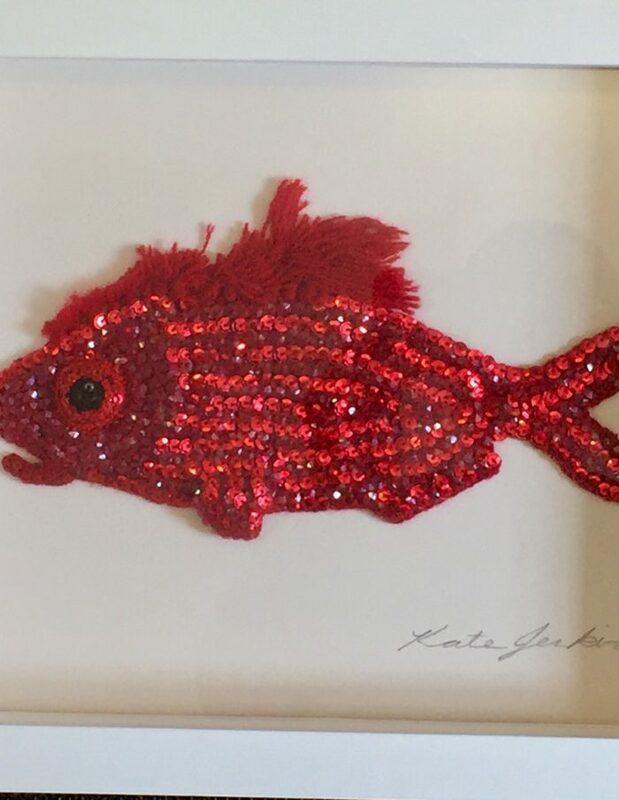 Price includes shipping in the U.K only for all other countries please contact the studio here info@katejenkinsstudio.co.uk for a price quote. 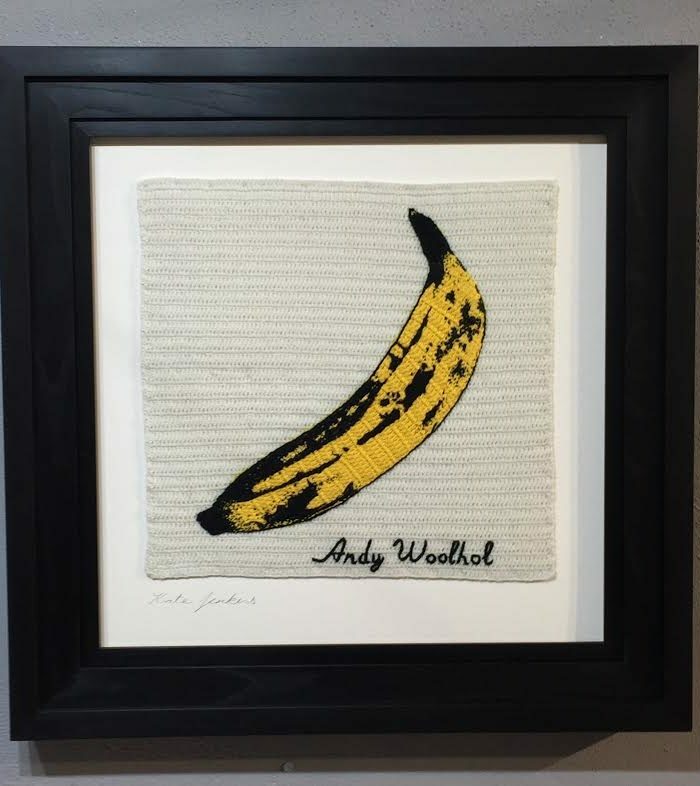 Here is my reworking of the classic Velvet Underground and Nico's Album produced by Andy Warhol on Verve Records featuring the iconic banana but adding my own textile related pun as the whole piece is crocheted in wool. 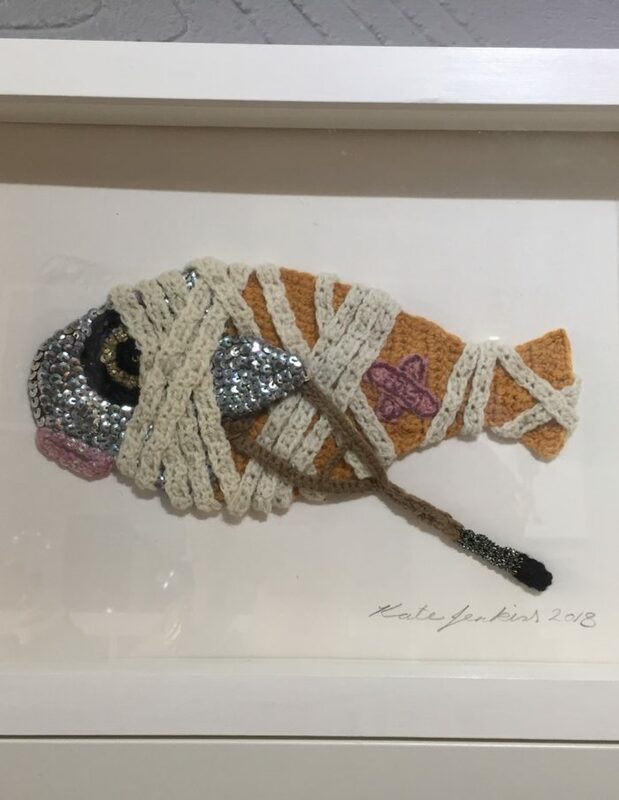 Hand Crocheted and embroidered the artwork is the same size as the original album cover and is presented in a black bespoke wooden frame with museum glass measuring 51.5cm x 51.5cm. 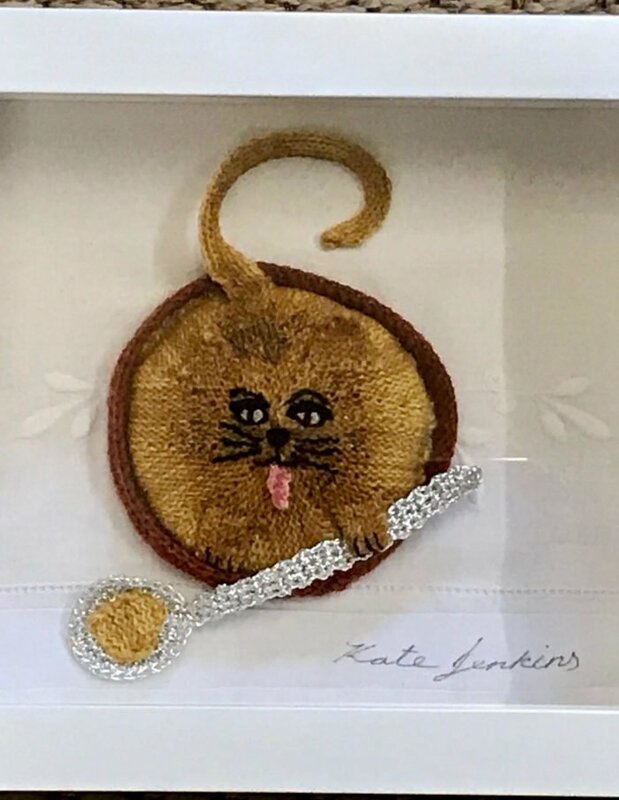 Price includes shipping in the U.K only for all other countries please contact the studio here info@katejenkinsstudio.co.uk for a price quote. 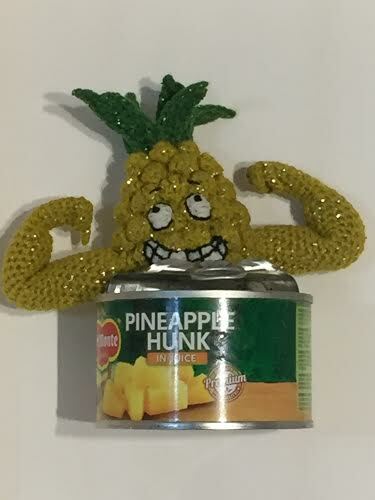 Hand Crocheted and presented in a recycled tin of pineapple chunks.... 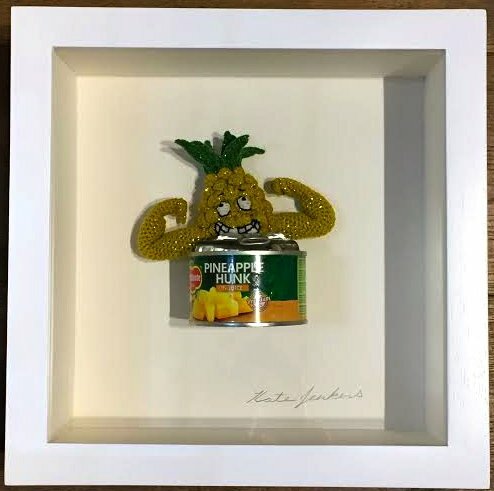 He's one chunk of a hunk ! 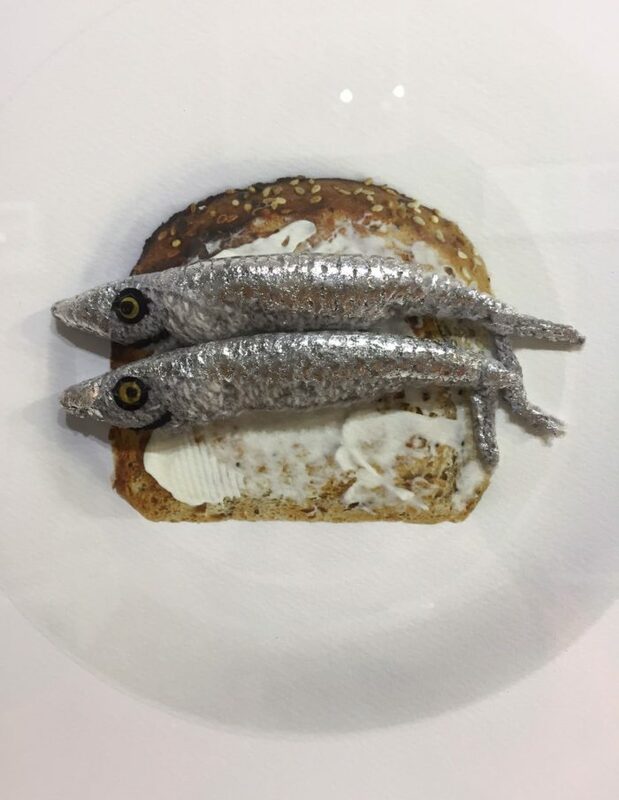 Knitted and sequined anchovies presented in a recycled tin and framed in a bespoke white wooden box frame measuring 25cm width x 21.5cm height. Price includes shipping in the U.K only for all other countries please contact the studio here info@katejenkinsstudio.co.uk for a price quote. 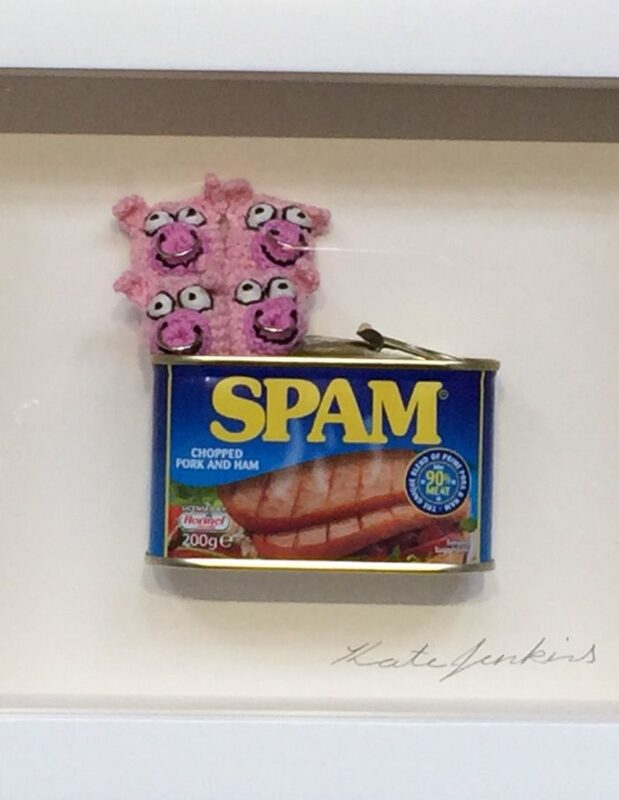 Hand crocheted pigs encased in a recycled tin of Spam presented in a bespoke white wooden box frame measuring 25cm width x 21.5cm height. 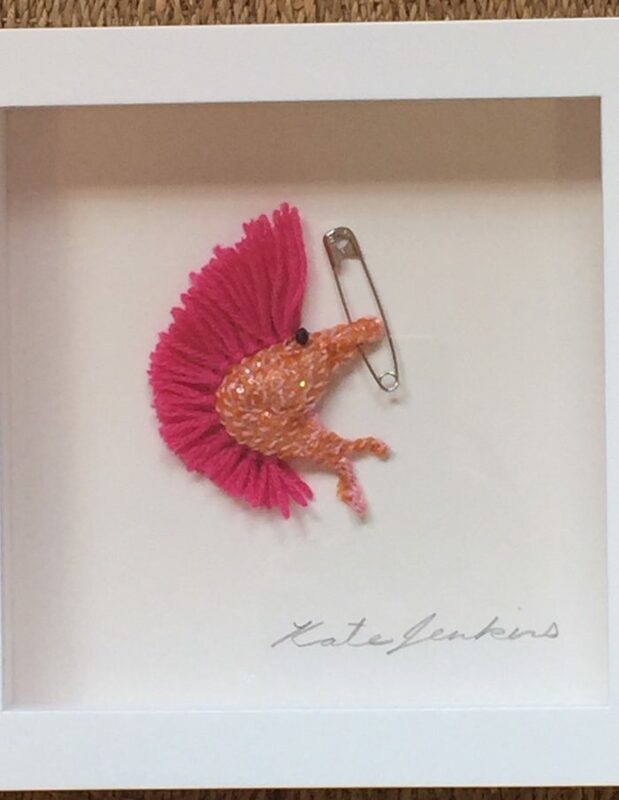 Price includes shipping in the U.K only for all other countries please contact the studio here info@katejenkinsstudio.co.uk for a price quote. 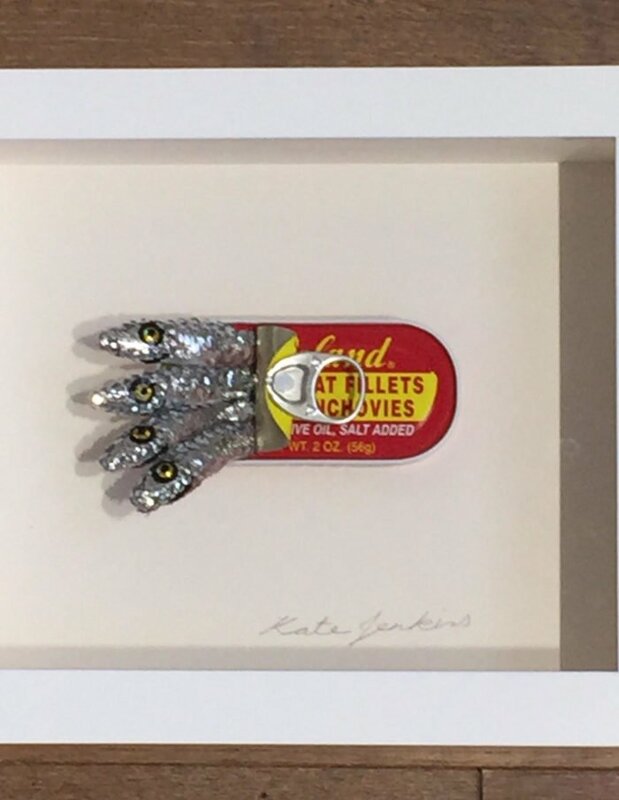 Knitted and hand sequined anchovies encased in a recycled tin and presented in a bespoke white wooden box frame measuring 25cm width x 21.5cm height. 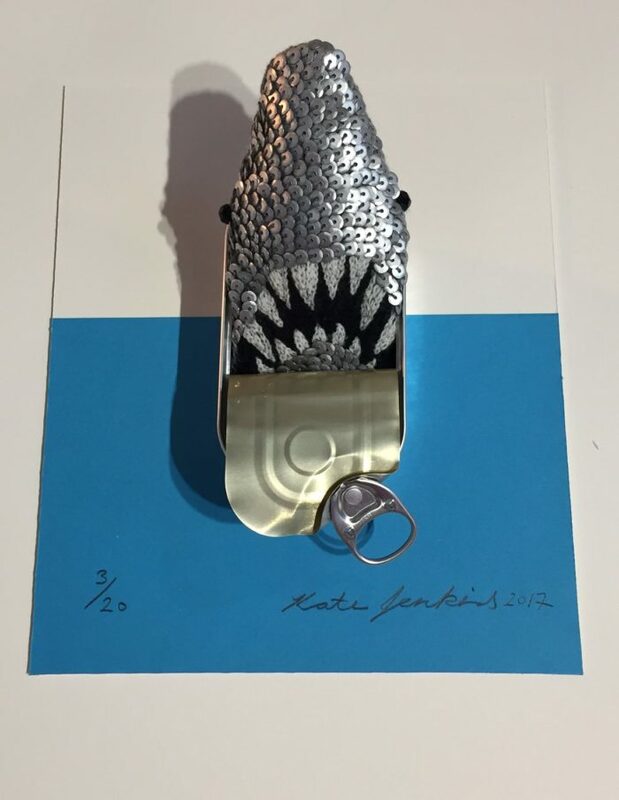 Price includes shipping in the U.K only for all other countries please contact the studio here info@katejenkinsstudio.co.uk for a price quote. 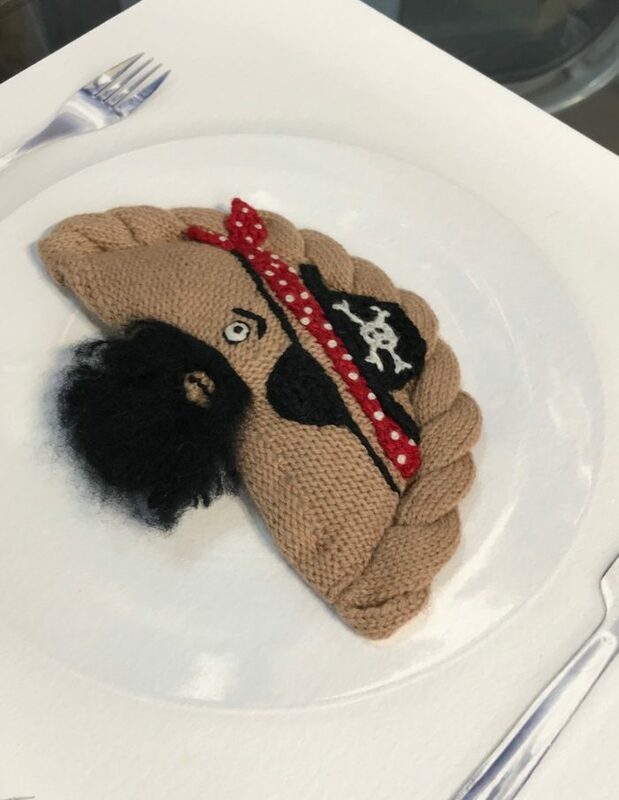 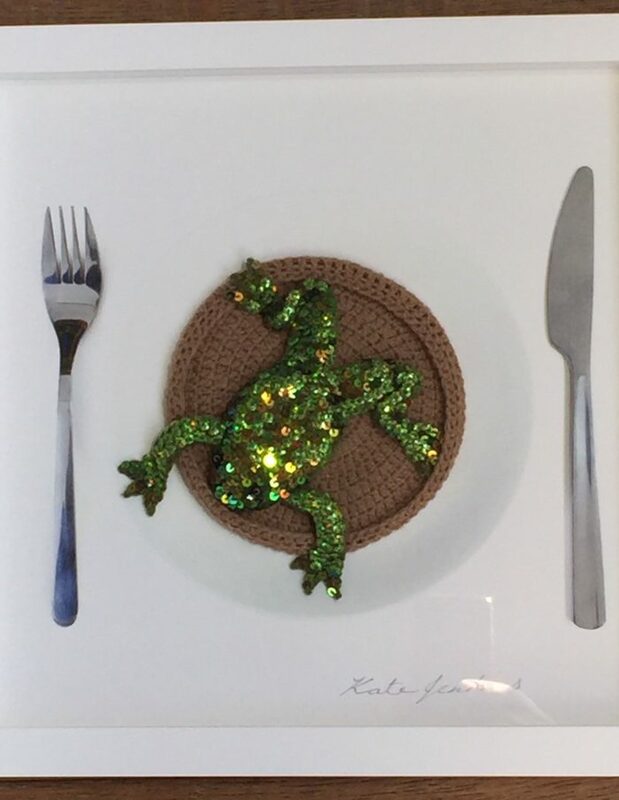 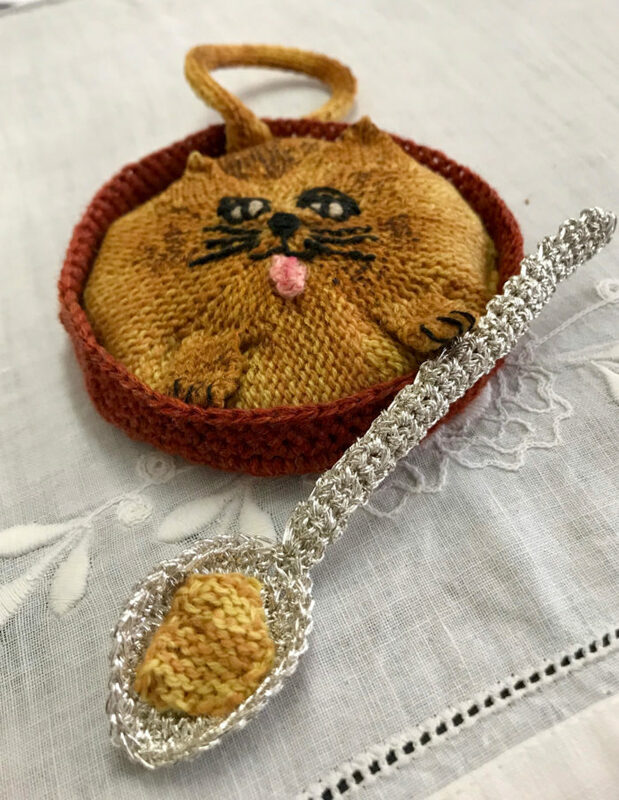 Hand sequined , knitted toad encased in a crocheted yorkshire pudding. 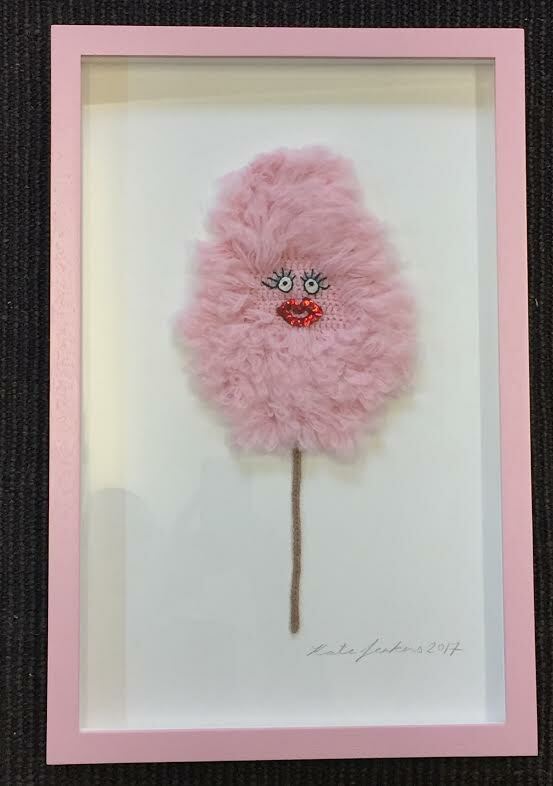 Framed in a bespoke white wooden box frame measuring 33cm x 33cm. 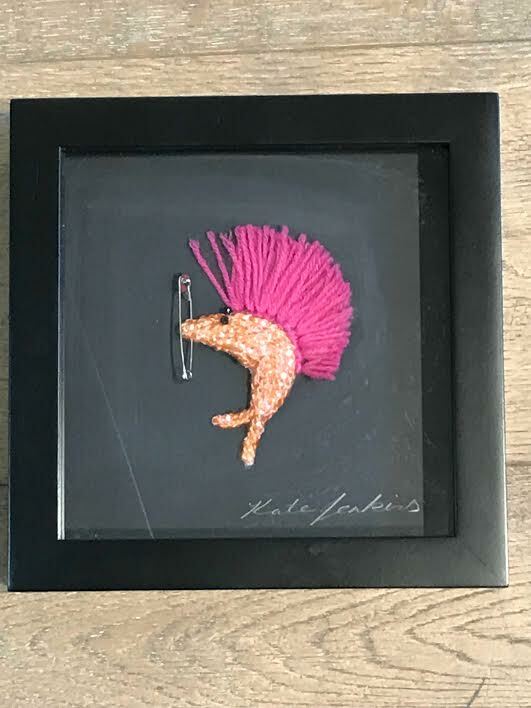 Price includes shipping in the U.K only for all other countries please contact the studio here info@katejenkinsstudio.co.uk for a price quote. 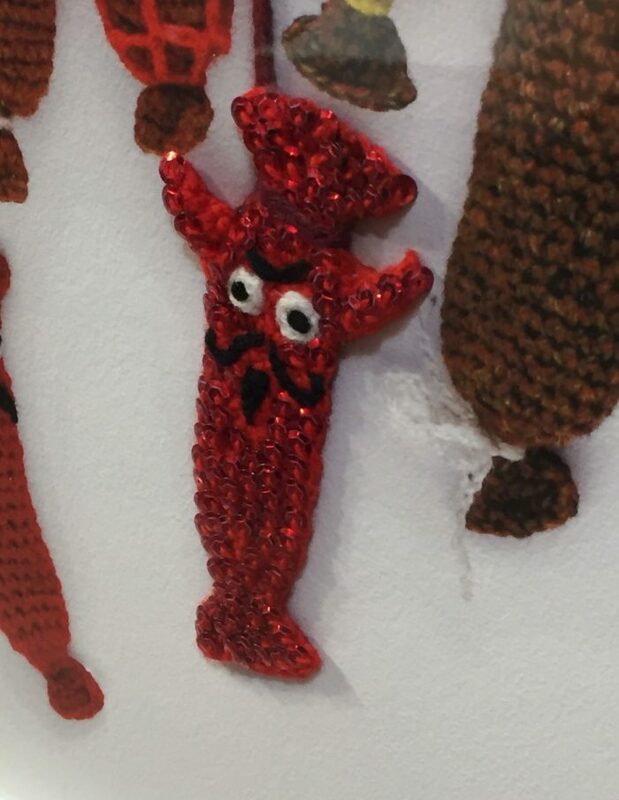 Hand sequined prawn with pink mohawk and safety pin through nose. 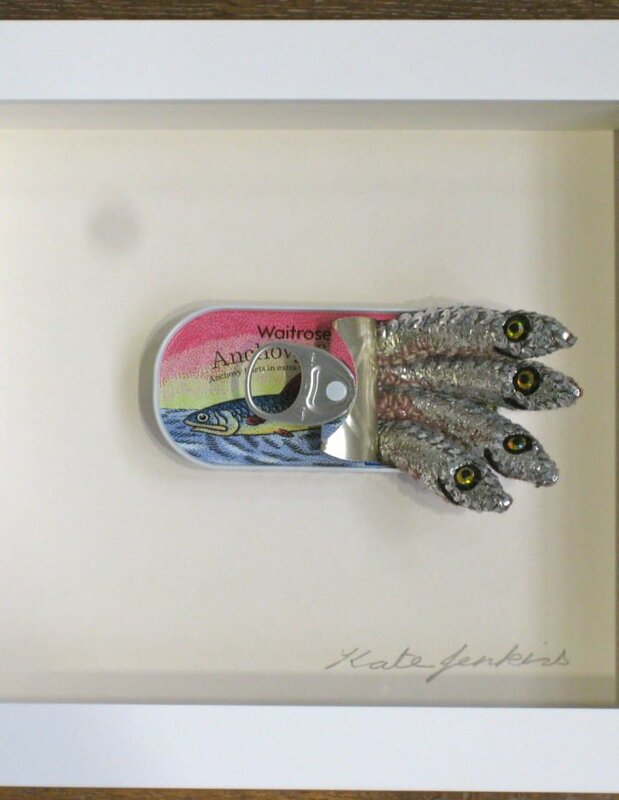 Presented in a bespoke white wooden box frame measuring 21cm x 21cm. 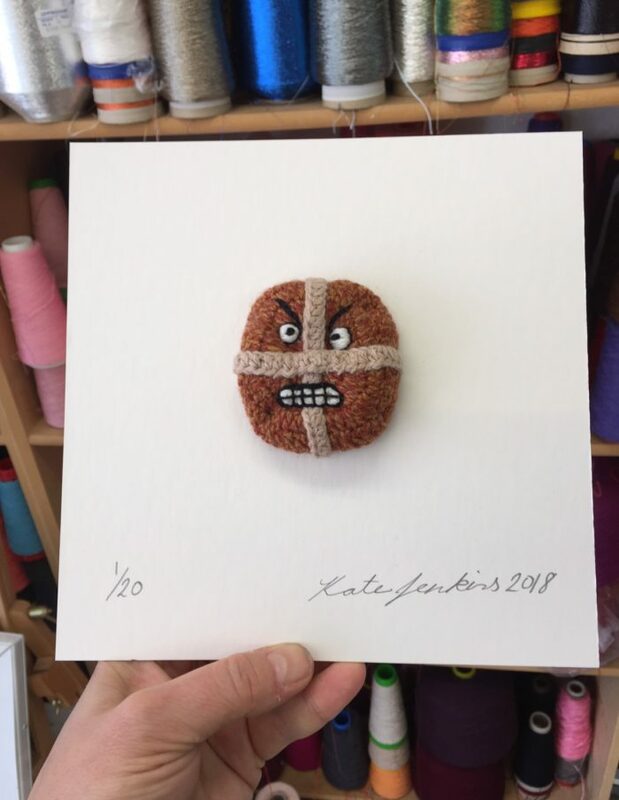 Price includes shipping in the U.K only for all other countries please contact the studio here info@katejenkinsstudio.co.uk for a price quote. 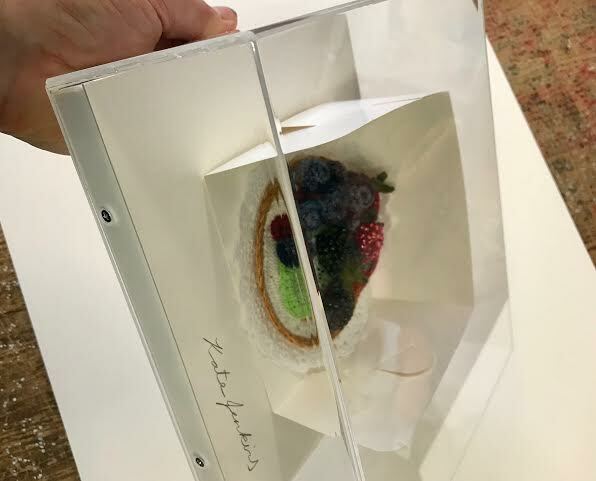 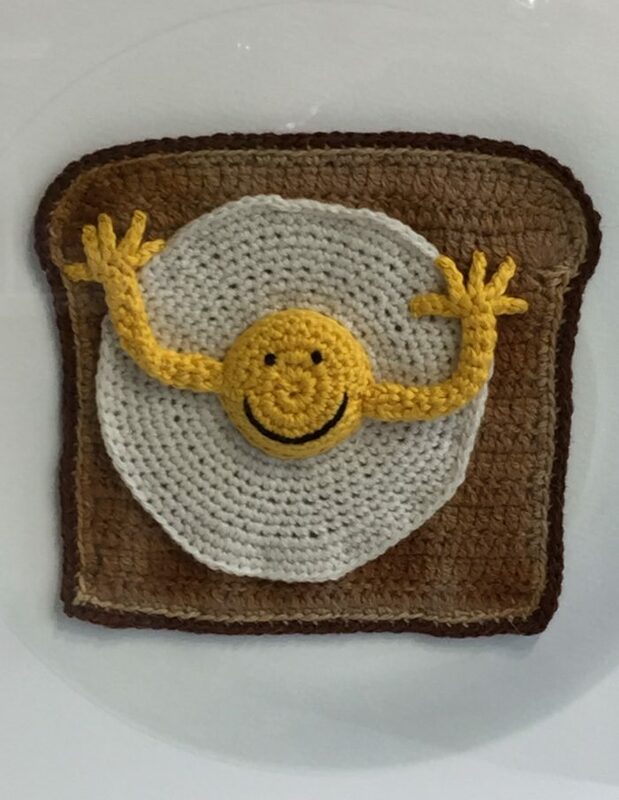 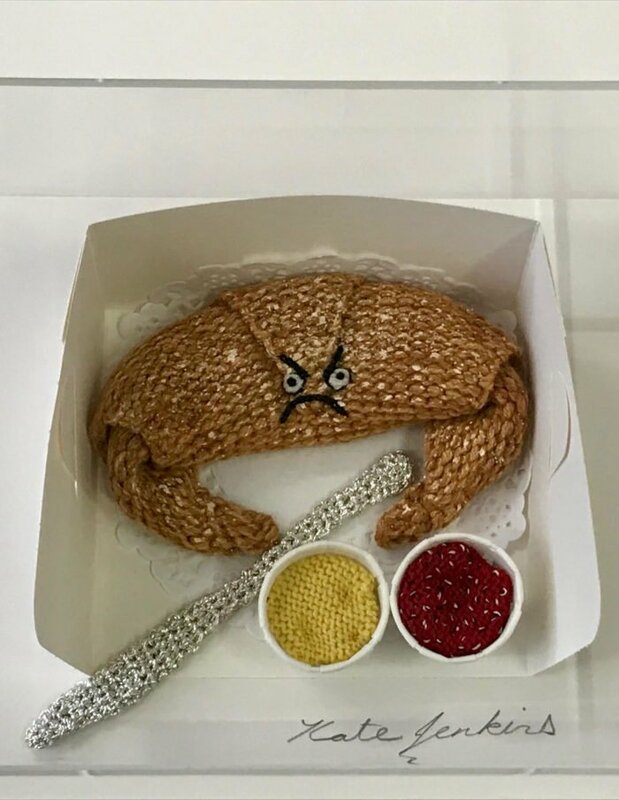 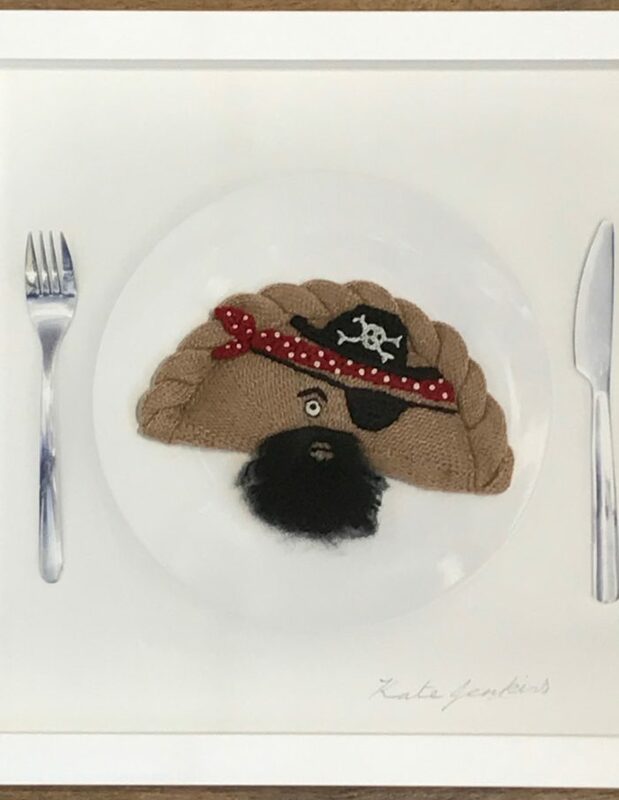 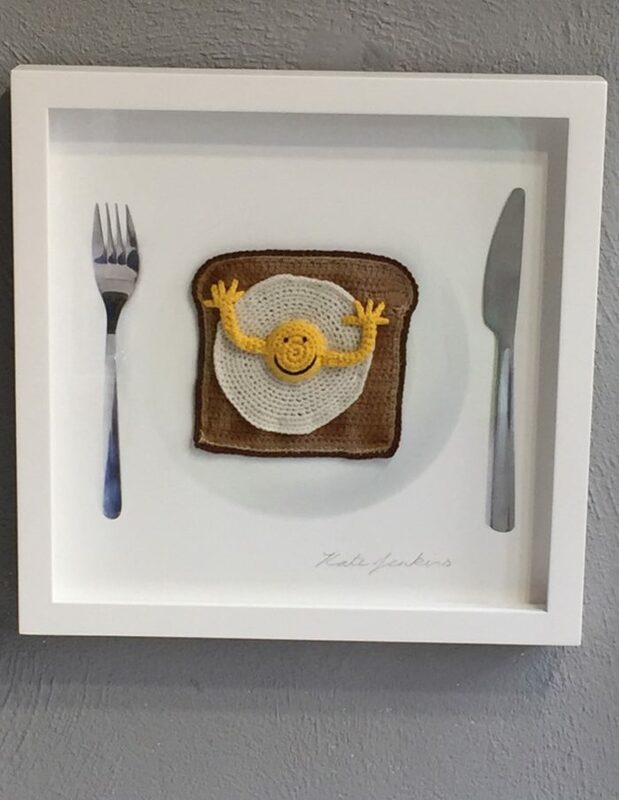 Hand crocheted egg on toasted lambswool hand stitched on to a giclée print of a fork knife and plate and presented in a white bespoke wooden box frame measuring 33cm x 33cm. 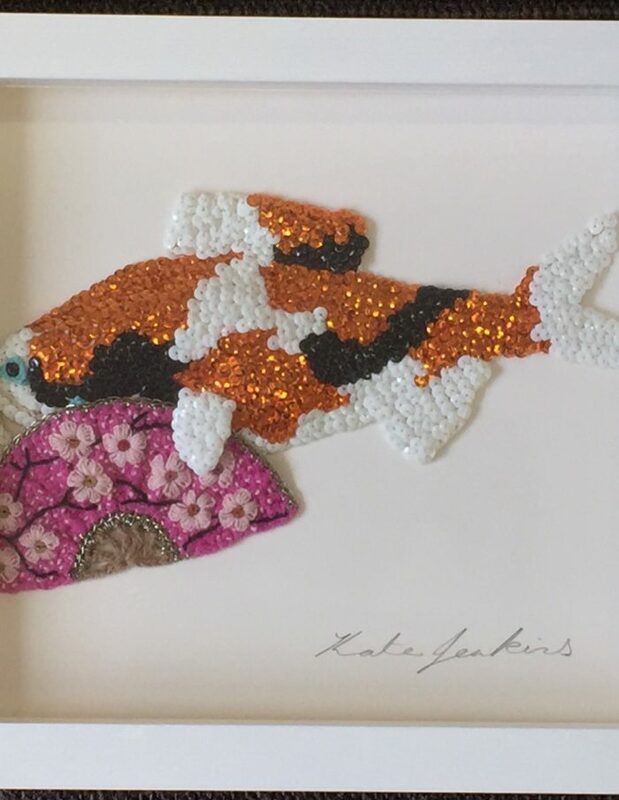 Price includes shipping in the U.K only for all other countries please contact the studio here info@katejenkinsstudio.co.uk for a price quote. 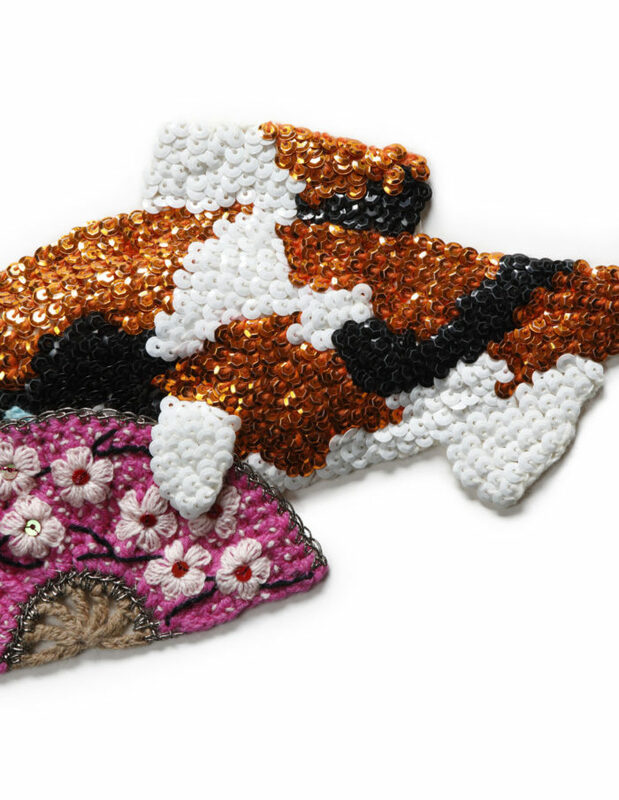 Giclee print entitled 'Hanging around' with hand crocheted sequined salami detail measuring 62cm width x 44.5cm height. 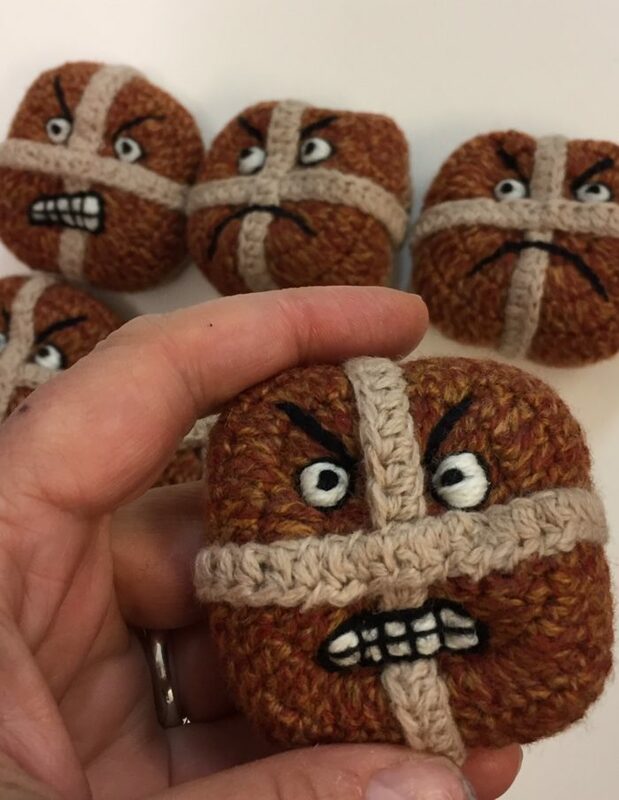 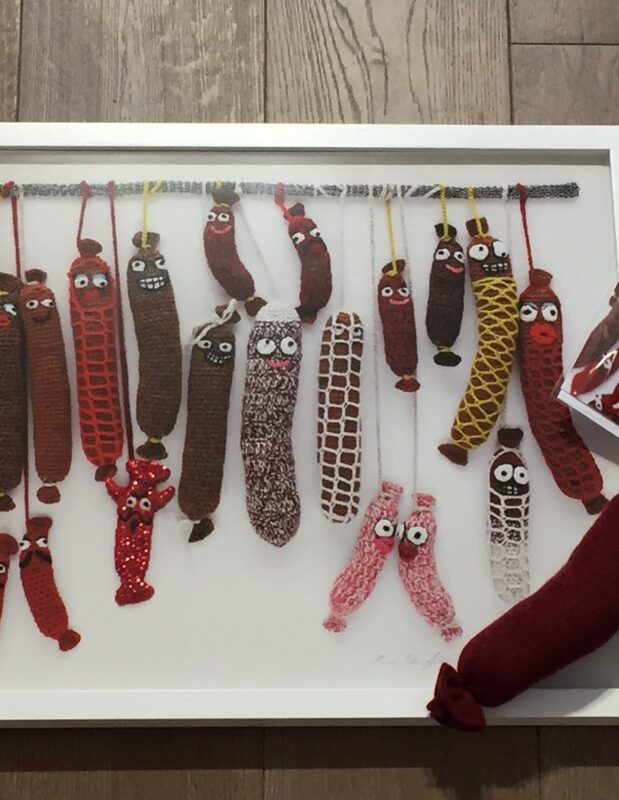 Gift pack includes a knitted salami to hang in your home and an A5 greetings card. 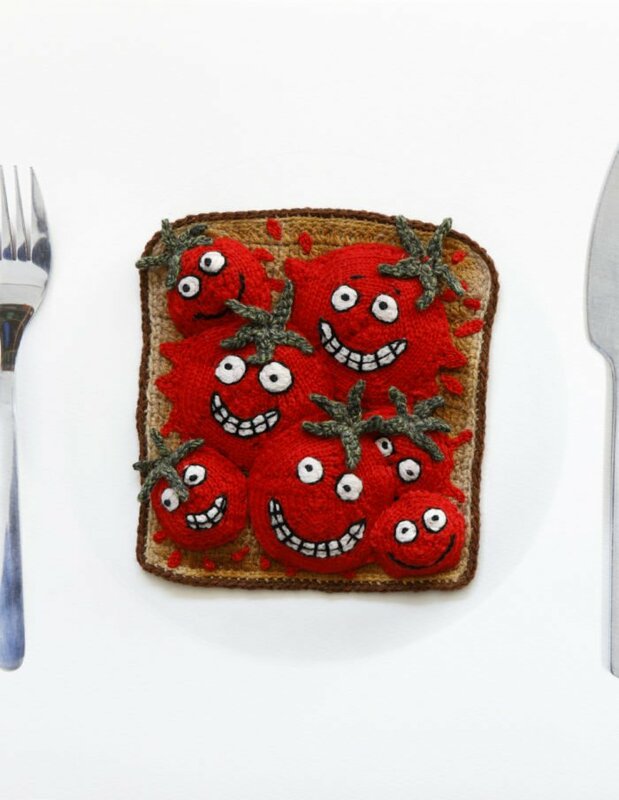 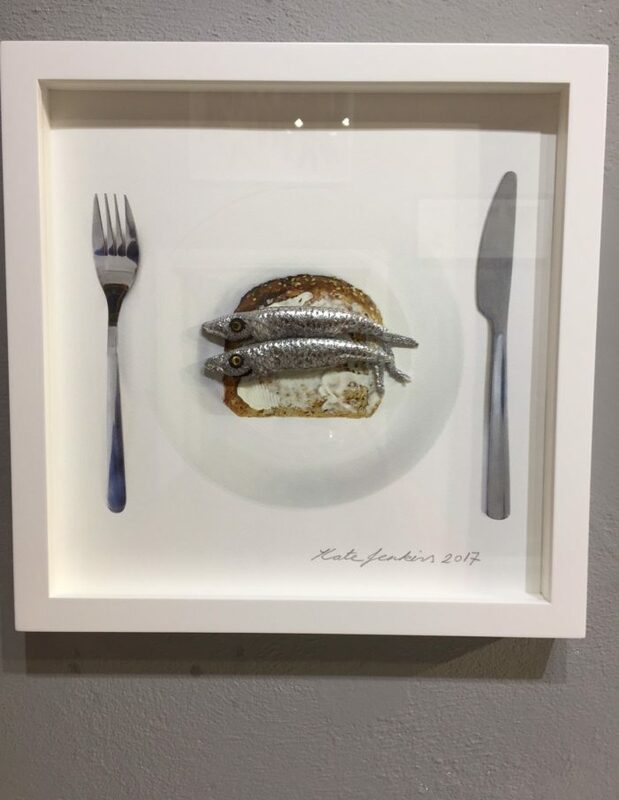 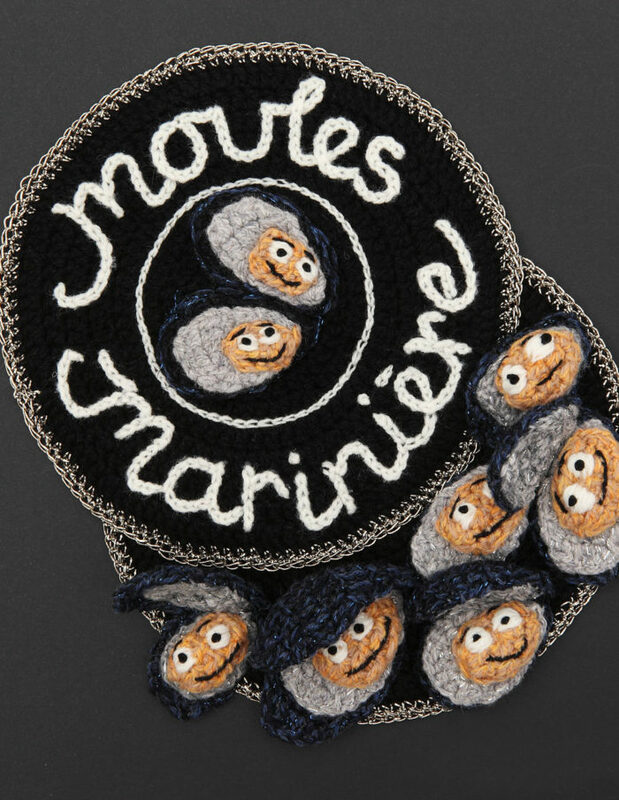 2 knitted sardines stitched onto a giclee print of a piece of buttered toast, fork and knife. 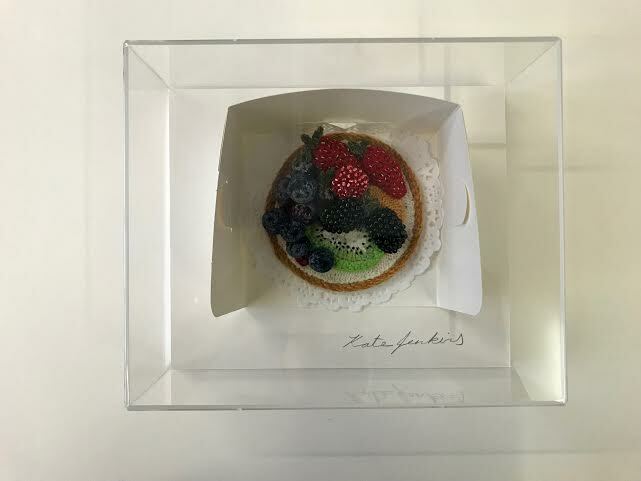 Presented in a bespoke white wooden box frame measuring 33cm x 33xm. 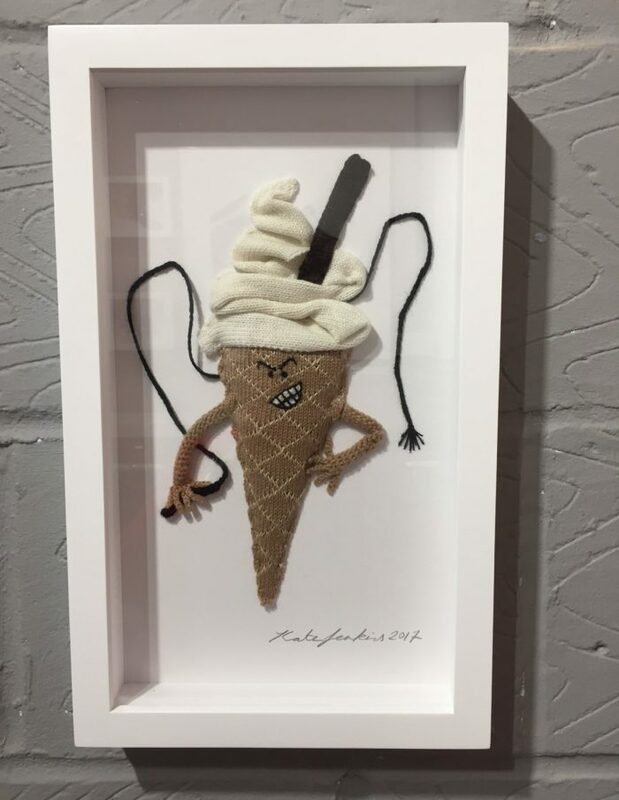 Fresh from an ice-cream van on the seafront in Brighton. 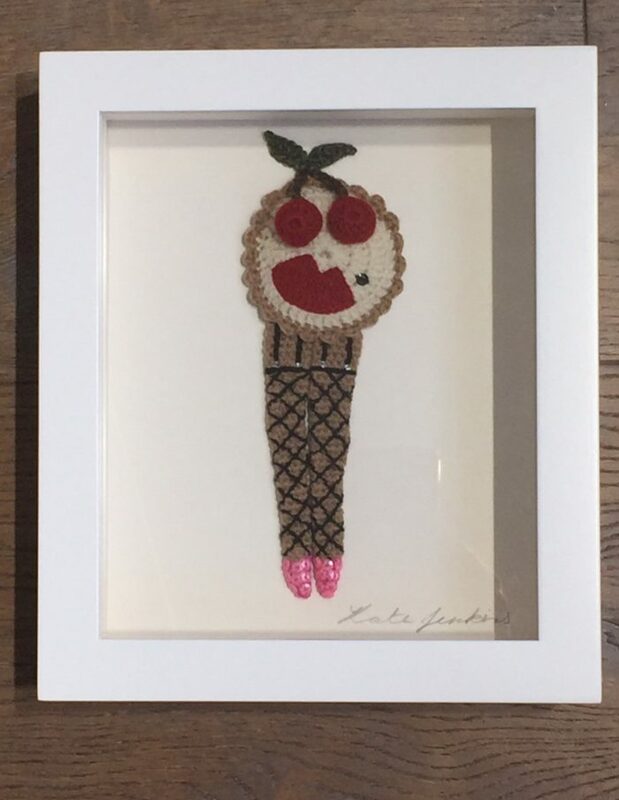 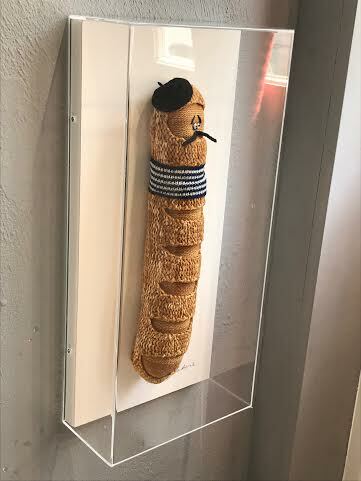 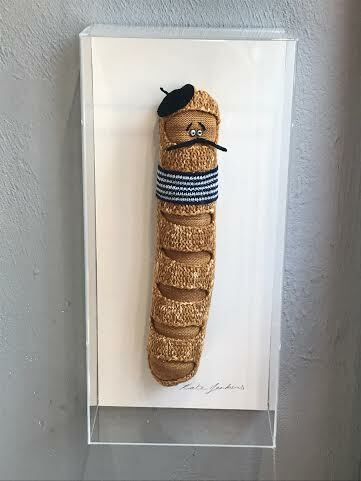 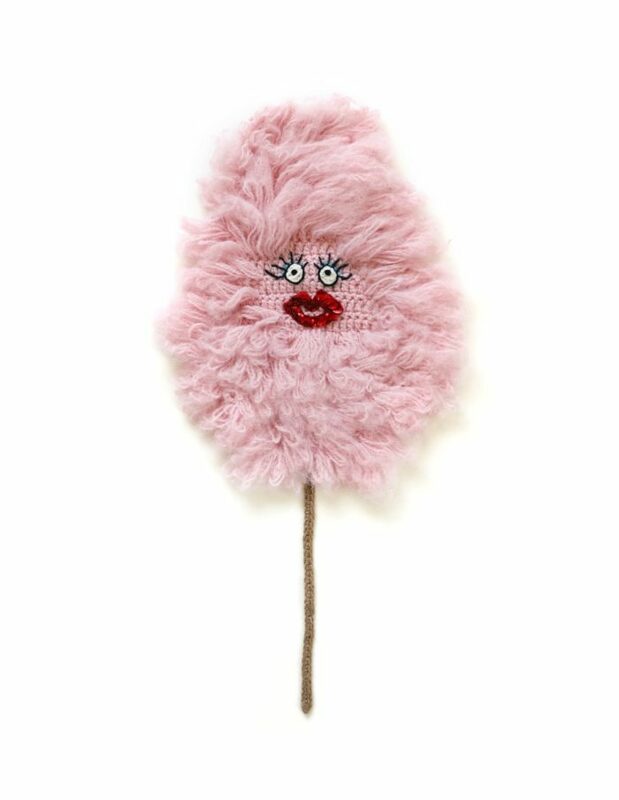 Mr Whippy is knitted in 100% lambswool and framed in a white wooden bespoke box frame measuring 24cm wide x 40 cm height.